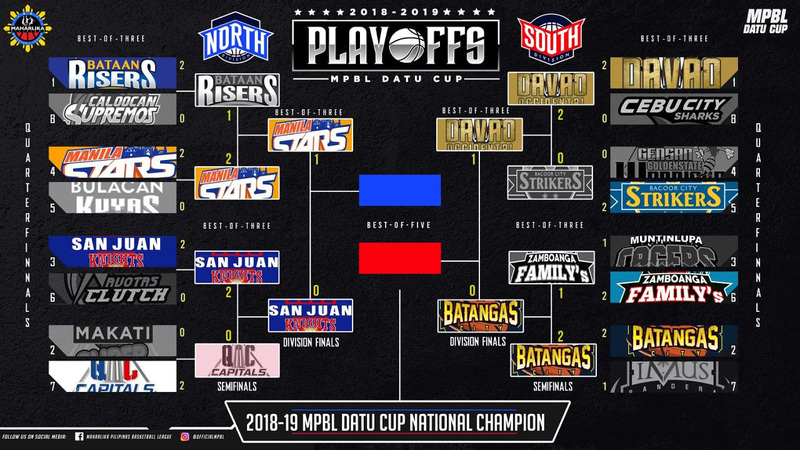 MPBL 2019: (April 4, 2019) Manila Stars defeated San Juan Knights, 91-88 in Game 1 of the MPBL's Datu Cup North Division Finals on Thursday night at the FilOil Flying V Centre in San Juan. MANILA 91 - Cervantes, Bitoon, Dionisio, Yap, Arellano, Cruz, M. Lopez, Belorio, Hayes, Laude, Parker, Montilla, J. Lopez, Acuno, Manalo, Sabellina. SAN JUAN 88 - Cardona, Wilson, Ayon Ayon, Rodriguez, Aguino, Jeruta, Muyang, Wamar, Reyes, Pelayo, Rios, Clarito, Marquez, Isit, Ubalde.